Investment in the Georgia-South Carolina Jasper Ocean Terminal’s first phase will be just under $500 million dollars. When all phases of the Georgia-South Carolina Jasper Ocean Terminal are complete, investment will total $2 billion. The Georgia-South Carolina Jasper Ocean Terminal will be built on recovered dredge material. The Georgia and South Carolina Ports Authorities have signed a new joint venture agreement that provides the necessary framework for the two states to work cooperatively toward the joint development and operation of the proposed Jasper Ocean Terminal (JOT). The updated agreement governs the permitting and planning process for the JOT, including development of the terminal, its design, and supporting infrastructure, as well as plans for financing, and execution of the operational decisions required during the permitting process. The plan includes geotechnical studies and conceptual work on terminal design by Moffatt & Nichol, the project manager and is expected to culminate with a permit application to the U.S. Army Corps of Engineers for the new terminal and channel modification study. Investment in the JOT’s first phase will be just under $500 million dollars. When all phases of the new facility are complete, investment will total $2 billion. Located 10 miles downstream of Savannah’s Garden City Terminal, the Jasper Ocean Terminal will be built on recovered dredge material on the South Carolina side of border between the two states. The Georgia Ports Authority, through its Savannah Harbor Expansion Project, is planning to deepen the river channel from 42 to 47 feet ahead of the required schedule for the terminal, and the South Carolina State Ports Authority also is planning to deepen the harbor in Charleston. 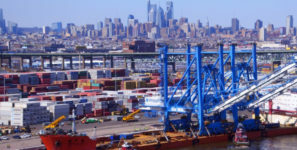 Once completed, the 1,500-acre JOT will be the largest terminal on the East Coast with 10 berths that have the capability of handling new post-Panamax ships of up to 12,600 TEU capacity, a turning basin, and road and rail access corridors. The JOT Joint Project Office was first established under an intergovernmental agreement signed in 2008 by the previous Governors of Georgia and South Carolina. The new agreement takes effect immediately and continues the work on the terminal project.